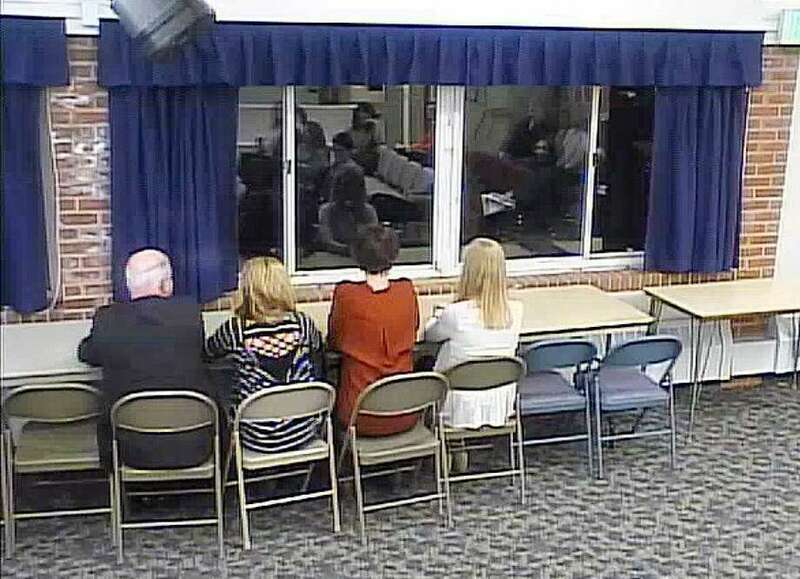 BOE members sit in chairs meant to mimic a bench seating style proposed for the cafeteria at a school board meeting in Darien, CT on Feb. 28, 2017. DARIEN — Despite setbacks, the rebuild of Darien High’s cafeteria is nearly complete. On Aug. 31 the cafeteria building committee voted to accept a change order for additional costs to the cafeteria project. This comes after it was determined the acoustic panels originally mentioned in the site plans needed to be redesigned. “We needed some adjustments to make it work the way it was intended to work,” said school board member Jill McCammon who is chairman of the cafeteria building committee. The additional cost is approximately $3,800 and will be covered by the contingency fund. After breaking ground earlier in the year the construction team found discovered utility wires that needed to be relocated. To cover the cost the committee used $60,000 of the project’s $93,310 contingency fund. The latest use of funds leaves $29,450 in the fund. KSR Construction, the subcontractor responsible for the panels, ran into engineering problems and determined the original design for the panels to be unsound. KSR originally submitted a bid for $46,204 to complete the acoustic panel work. The decision to redesign the acoustic panels led to an increased cost and potentially a lengthier timeline for the installation. Erik A. Kaeyer, from KG&D Architects, said the original attachment system for the panels were not going to work. The more reasonable price point was using the original panels and coming up with a custom attachment system, he said. “We did our due diligence. We worked hard to come up with a solution that was going to be both functional in terms of acoustic panels, as well as exciting and for this space,” Kaeyer said. McCammon said the committee has agreed to pay for the material and the contractor and the architect have agreed to pay for any additional installation costs. The additional cost did not impact the cost of the project by much, she said. The acoustic panels on the ceiling of the cafeteria were on schedule. The additional costs incurred were for the panels that lined the hallway between the wall and cafeteria. The committee also voted to accept a change order for the tie-in of the interior renovated space and the newly expanded space. McCammon said they were expecting a tie-in cost as a necessary outcome of separating the cafeteria project into two components. The project was estimated to cost a total of $1.6 million in May. The cafeteria is currently open for Darien High School students and the acoustic panels are scheduled to be finished by December.